CERN Home IT Home Sitemap Phonebook Need Help? Successful Visit of UK DTI Mission on Information Technologies. Welcome to the External Collaboration and Outreach site of the IT Department. actions to actually transfer, share or jointly develop technologies (actual Technology Transfer). This site describes these various activities. IT department activities focus on the fast changing Information and Communications Technologies (ICTs), which often require that the necessary developments are conducted in collaboration with external partners. As a result, collaborations and partnering with external organizations are essential channels in the department for interactions with the outside world. A major channel for outreach is education, conferences, scientific publications and more generally outreach activities. A major channel for actual TT is transfer of software technologies via collaboration agreements or more frequently via open source mechanisms. 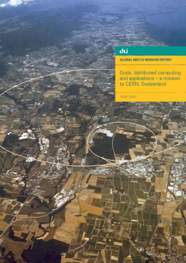 This Web page contains pointers to material related to the Information Technology Department at the European Organization for Nuclear Research (CERN). These materials are publicly available on the Web exclusively for the benefit of the staff and users of CERN.